You could hardly put together a better synoptic weather set-up for a HUGE lake effect snow event than what happened today in Buffalo. 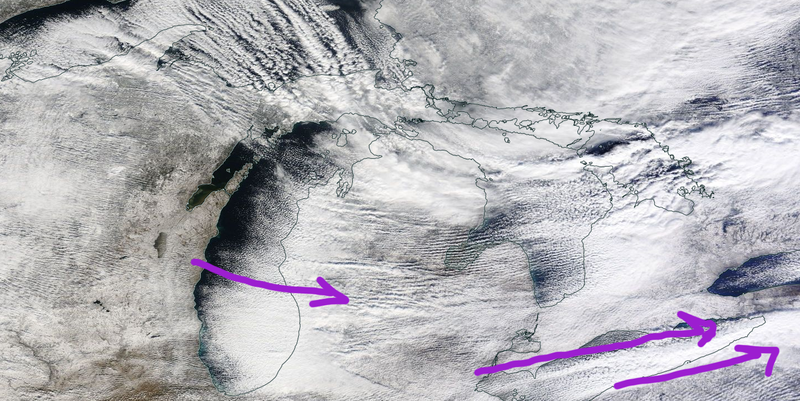 A mid-January type outbreak of Polar air rushing across the Great Lakes (that are still “November warm”), and the result is nearly 4-5 feet of snow in Western New York.Travel is totally stopped to the South (and southeast) of Buffalo this evening, and heavy lake effect is falling in other spots around the Great lakes as well. This picture from one of Don’s viewers was on his Facebook page this evening. Jen Dix was buried in South Buffalo. Lake effect snow is a tough forecast for meteorologists, and my fellow Broadcast Meteorologists all know that Don Paul is the person to talk to when you have a question about lake effect. Don has been forecasting it for years, and he called this one on the money. It’s not everyday that you forecasts snowfall in feet or meters, and you can check out Don’s Facebook page for some incredible pics from his viewers. There are several factors that are critical to forecasting lake effect events, and the two most important are the temperature difference between the surface of the water, and the air at about 5,000 feet above the surface. Meteorologists look at the 850 millibar pressure level which is about 5,000 feet, and when the temp. at 850 mb is lower than the lake surface by about 13-15C, then the air over the lake will be very unstable and convective showers will form. This late word from the NWS in Buffalo. Just a wind change by as much as 10 degrees can greatly affect the areas and the amounts in a lake effect snow event, so it is indeed a tough forecast to make. Smart forecasters tend to become experts on the high impact weather events that they most often see in their area, and folks like Don Paul (and the local NWS forecasters) in the lake effect areas are just that. Here in Maryland, I worry about nor’easters and East Coast hurricanes! One last thing to mention, and that has to do with how a warming planet will impact lake effect events. When the lakes freeze the snow machine stops, so if we see less lake ice during the winters in the future, then we may see more lake effect snow than we do now. It’s a tough call though, because we may see less cold air as well. There does seem to be a trend upward in snowfall however, as the graphic produced by the folks at Climate Central below shows. 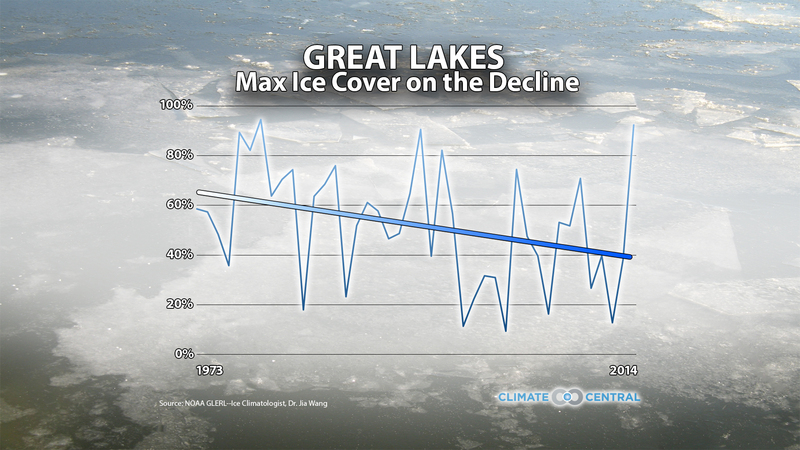 Great lakes ice is highly variable from year to year, so a trend is more difficult to see, but there does seem to be a trend down in maximum ice cover over the Great Lakes as a whole. Ctsy. Climate Central. See cite on graphic. I leave you with this meme that is floating around the internet tonight. Lake Erie is about 45 F today and the air is about 15F, the moisture is falling out as snow the second it passes over the land. The normal pattern is predicated on elevation and lake water at a much lower temperature. Yes the warm water is a MAJOR factor in the amazing snowfall. Still the same rules apply with fetch/wind angle and shear. No snow and sunny all day Tuesday. We’re supposed to get one inch here in Jamestown. Fun watching all the happy weather geeks on Buffalo TV and The Weather Channel. What a mess though! Small grammatical error in the second sentence of the second paragraph.